To provide state of the art bioimaging, analytical, flow cytometry, and specimen preparation instrumentation and support to facilitate the data collection and analysis by Junior PIs (JPIs), other COBRE PIs, and non-COBRE PIs and their staff. To provide training to JPIs, COBRE mentors and their staff, as well as to other PBRC researchers on the proper use of our instrumentation. To continually enhance our existing expertise in microscopy, image analysis, immunofluorescence, immunohistology, and flow cytometry and to provide this expertise to PIs and other researchers through hands on training, collaborations or other communicative means. To develop new techniques, assays, and protocols that make full use of our current infrastructure to enhance the overall competitiveness of our faculty. 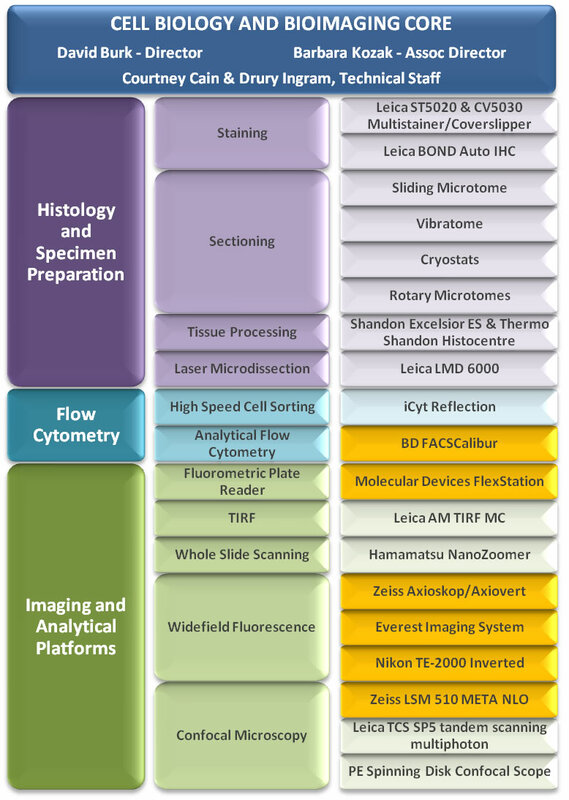 During the next funding cycle the Cell Biology and Bioimaging Core will continue to expand its repertoire of protocols and modalities that can be used in projects requiring advanced imaging techniques as well as analytical or immunohistological approaches. We will develop an active outreach program to educate PBRC post docs as well as their PIs and other PBRC staff in the capabilities of the CBBC and make novel methods as well as useful protocols freely available to our user base through electronic means. The Genomics Core Facility seeks to achieve high quality and cost effective research data production by providing research services, sharing instrumentation, and providing the expertise of facility personnel to the research community. Significant challenges are presented to the researcher by advanced technologies that will continue to rapidly evolve for the foreseeable future. The Genomics Core Facility must embody a structure that provides substantial support from the inception of an experiment through final data analysis. 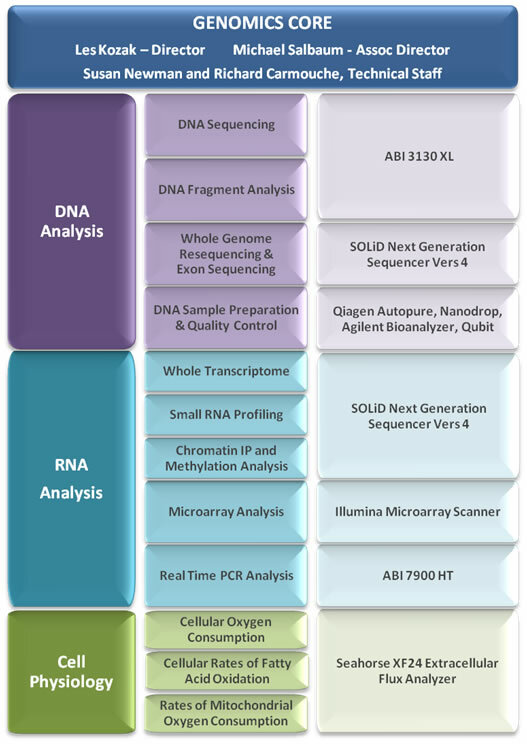 To this end, the Genomics Core Facility provides consultation with the investigator and their research associates to insure well-designed experiments with specific recommendations for adequate sample number, sample collections, and RNA and DNA isolation protocols. Support is continued throughout the performance of the experiment through direct services of the core or through education of the investigator’s laboratory technicians who use shared instruments provided in the core. Data analysis is performed and facilitated using a number of software tools specifically chosen to provide the progression of data handling from raw data input to an analyzed dataset. 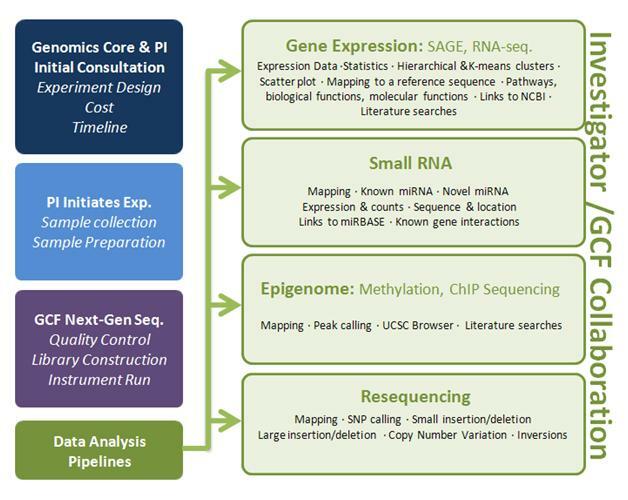 Included are analyses such as measures of expression and statistical significance; application-appropriate sequence mapping; clustering, pathway, biological function, and molecular processes; and literature searches for areas of significant interest to the investigator in the context of the experiment.